Pluto is an extremely distant world, orbiting the sun more than 29 times farther than Earth. With a surface temperature estimated to be about 380 degrees below zero Fahrenheit (around minus 229 degrees Celsius), the environment at Pluto is far too cold to allow liquid water on its surface. Pluto's moons are in the same frigid environment. Pluto's remoteness and small size make it difficult to observe, but this month, July of 2015, New Horizons spacecraft has started to provide the most detailed observations to date. “There is a real possibility that New Horizons will discover new moons and rings as well,” says Stern. Already, Pluto has five known moons: Charon, Styx, Nix, Kerberos, and Hydra. Numerical simulations show that meteoroids striking those satellites could send debris into orbit, forming a ring system that waxes and wanes over time in response to changes in bombardment. “We’re flying into the unknown,” says Stern, “and there is no telling what we might find." The closest approach is scheduled for July 2015 when New Horizons flies only 10,000 km from Pluto, but the spacecraft will be busy long before that date. The first step, in January 2015, is an intensive campaign of photography by the Long Range Reconnaissance Imager or “LORRI.” This will help mission controllers pinpoint Pluto's location, which is uncertain by a few thousand kilometers. AS of this April 2015, the spacecraft took pictures of Pluto that surpass the best images from Hubble shown below. By closest approach this month, July 2015, a whole new world will open up to the spacecraft’s cameras. If New Horizons flew over Earth at the same altitude, it could see individual buildings and their shapes. 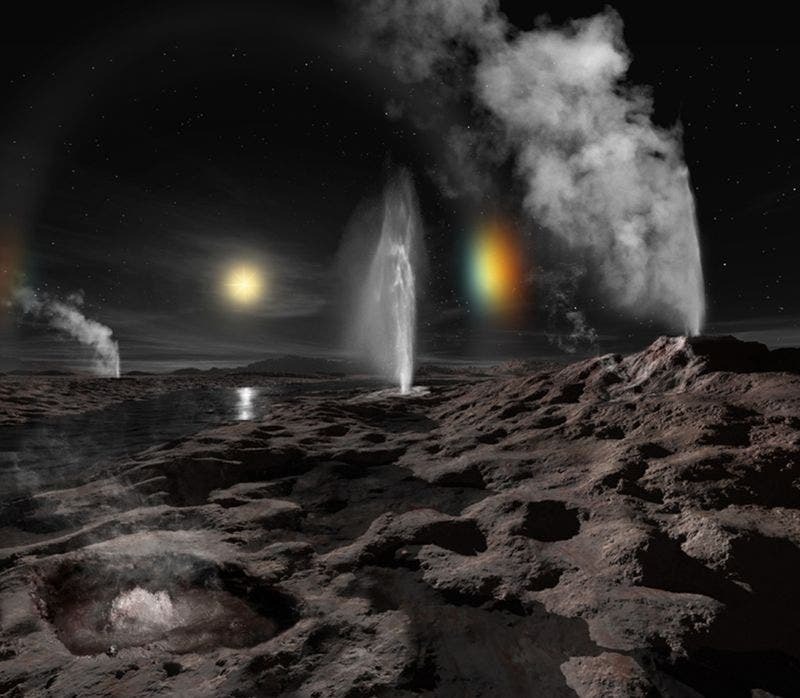 The image above NASA space-artist Ron Miller's concept of geysers and sundogs on Pluto. Stern likens New Horizons to Mariner 4, which flew past Mars in July 1965. At the time, many people on Earth, even some scientists, thought the Red Planet was a relatively gentle world, with water and vegetation friendly to life. Instead, Mariner 4 revealed a desiccated wasteland of haunting beauty. New Horizons’ flyby of Pluto will occur almost exactly 50 years after Mariner 4’s flyby of Mars—and it could shock observers just as much. Although temperatures on Pluto's surface hover around -230 °C, but researchers have long wondered whether the dwarf planet might boast enough internal heat to sustain a liquid ocean under its icy exterior. Guillaume Robuchon and Francis Nimmo at the University of California, Santa Cruz, have calculated that the presence of an ocean depends on two things: the amount of radioactive potassium in Pluto's rocky core, and the temperature of the ice that covers it. Density measurements suggest a rocky core fills 40 per cent of the dwarf planet's volume. If the core contains potassium at a concentration of 75 parts per billion, its decay could produce enough heat to melt some of the overlying ice, which is made of a mixture of nitrogen and water. It should have at least that much potassium and probably more, says William McKinnon at Washington University in St Louis, Missouri, who points out that Earth, which probably formed with less of the volatile element due to its closer distance to the sun, has 10 times that concentration in its core. Heat from Pluto's core will trigger convection in the surrounding ice, and if the ice churns too quickly, the heat will simply escape into space before it can do much melting. If it flows substantially more slowly than Antarctic glaciers on Earth, however, then the top 165 kilometres of ice could provide enough insulation for a liquid ocean of the same depth to exist below, the team concluded. The viscosity of the ice depends on the size of individual ice particles, with smaller grains flowing more easily. There is no way to measure this from Earth, but Pluto's shape could reveal evidence of an ocean, the team says. Pluto's spin is slowing down due to tugs from its large moon Charon. Fast-spinning objects bulge out at their equator, but a soft interior would allow the world to relax into more of a sphere as its spin slows down. NASA's New Horizons probe will image the dwarf planet's shape when it flies past in 2015. In 2011, the highly sensitive Cosmic Origins Spectrograph aboard the Hubble Space Telescope discovered a strong ultraviolet-wavelength absorber on Pluto's surface, providing new evidence that points to the possibility of complex hydrocarbon and/or nitrile molecules lying on the surface, according to researchers from Southwest Research Institute and Nebraska Wesleyan University. These chemical species can be produced by the interaction of sunlight or cosmic rays with Pluto's known surface ices, including methane, carbon monoxide and nitrogen. "This is an exciting finding because complex Plutonian hydrocarbons and other molecules that could be responsible for the ultraviolet spectral features we found with Hubble may, among other things, be responsible for giving Pluto its ruddy color," said Stern. The team also discovered evidence of changes in Pluto's ultraviolet spectrum compared to Hubble measurements from the 1990s. The changes may be related to differing terrains seen now versus in the 1990s, or to other effects, such as changes in the surface related to a steep increase in the pressure of Pluto's atmosphere during that same time span. "The discovery we made with Hubble reminds us that even more exciting discoveries about Pluto's composition and surface evolution are likely to be in store when NASA's New Horizons spacecraft arrives at Pluto in 2015," Stern added. If the icy surface of Pluto's giant moon Charon, shown along with Pluto is cracked, analysis of the fractures could reveal if its interior was warm, perhaps warm enough to have maintained a subterranean ocean of liquid water, according to a new NASA-funded study. "Our model predicts different fracture patterns on the surface of Charon depending on the thickness of its surface ice, the structure of the moon's interior and how easily it deforms, and how its orbit evolved," said Alyssa Rhoden of NASA's Goddard Space Flight Center in Greenbelt, Maryland. "By comparing the actual New Horizons observations of Charon to the various predictions, we can see what fits best and discover if Charon could have had a subsurface ocean in its past, driven by high eccentricity." Heat from Pluto's core will trigger convection in the surrounding ice, and if the ice churns too quickly, the heat will simply escape into space before it can do much melting. If it flows substantially more slowly than Antarctic glaciers on Earth, however, then the top 165 kilometres of ice could provide enough insulation for a liquid ocean of the same depth to exist below, the team concluded..